My name is Samuel Partida, Jr. I'm just another criminal law attorney. Not staying current with the case law. There it is. My admission. It’s out there. I’m a pretty boring guy. Sorry to disappoint if you were looking for something juicer. That’s all I got. It just gnawed at me knowing that cases were being released that could change the outcome of my cases. I wanted to keep up, but I couldn’t. Many of the courthouse gurus subscribed to expensive legal services that helped them stay up to date. The wise men, that were for sure reading all the cases as they came out, were upper level public sector guys who had the time for that kind of thing. I wanted to be smart like those guys and gals, but I couldn’t bring myself to pay for expensive services when I knew darn well all the information was public knowledge made available FREE to all of us. Who else would have married one complicated, tedious, time consuming task with another complicated, technological, and completely unnecessary task – just to ensure that both got done? Back then I was listening to an academic podcaster by the name of Ross Roberts. Who was doing some pretty cool things, and even though I had no economics background I learned enough from EcononTalk that I could call myself a Hayekian. The point is, I was learning complicated stuff from a podcast! 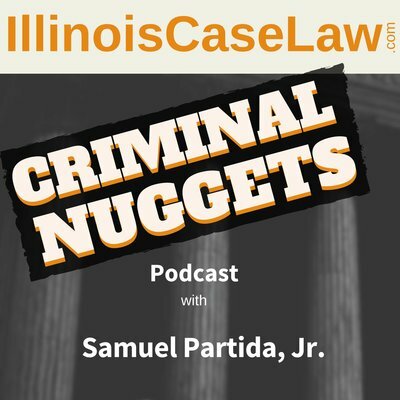 I looked and looked for the podcast on Illinois criminal law. I did not find it. No one was creating a podcast covering the criminal cases. That’s when I decided to do it myself. I could read the cases, create the podcast, and use each task as motivation for the other. When I am not reading case law, I might be driving an RV somewhere or losing the race down the slope somewhere else. What makes me qualified to put this out there? I’m no law professor, and I'm no writer. You won't have too look to far to find something written that will make a high school honor student cringe (I'm talking about my daughter here). I even make up words on the podcast, depending on how I feel when I record. I’m just a guy who figured out how to use a microphone and a mixer. I am a former prosecutor, and prior Kane County litigator of the year. But above all, I’m addicted to the cases. I love classifying, sorting, and giving meaning to the decisions. No-sir-ree-bob, I am not the smartest guy out there. But I will continue to produce the podcast because it makes me feel like I'm getting smarter. That’s how I got here. We all know times are different. We are living in a new age. The internet can make us all broadcasters. For now, I choose to use this technology to do the best I can to bring the latest criminal issues to the defense bar. You too can benefit from what’s going on here. Even though I started this for self serving reasons, I think it’s truly amazing that my peers can also learn and benefit from this project. It’s crazy that listeners start to feel the very same level of enhanced smartness that I’m experiencing. My audio law learners become just as aware of the latest findings and court rulings. I want this podcast and website to be truly helpful to you. The aim and goal is simple. I read, summarize, and analyze Illinois criminal case law so the busy criminal practitioner doesn't have to do it. If you have any interest in the criminal law, you'll find something useful here. Subscribe on iTunes, Android, or Stitcher today. Join Myself & Other Smart Lawyers who are committed to staying engaged, focused, and interested in the case law. P.S. – Do you know how to become the smartest lawyer in the courtroom that knows how to get the the judge to do what you want? Click below to find out.